The Neverfull was introduced by Louis Vuitton in 2007. High on the wishlist of every woman, brand conscious or otherwise, the bag has unfortunately spawned several counterfeits. Luckily Louis Vuitton bags have many intricate details, some too difficult to replicate. There are no LV outlets, no seconds and no discounts on new bags. Pre-owned bags that are offered at discounted prices may also be fakes. There should be no plastic wrapping around the handles. The tags (if any) are placed in the dust bag and never come attached to the bag. There is no plastic authenticity card. 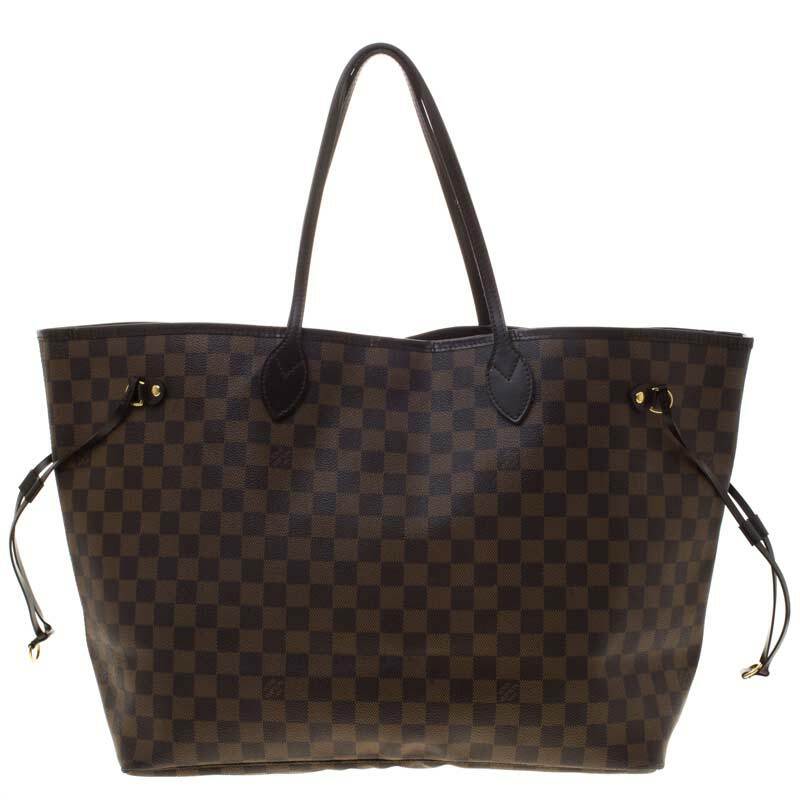 The Damier Neverfull is always in the Azur (beige with blue) or Ebene (beige with light brown) canvas. The Graphite (grey with dark grey) is reserved for men’s accessories and the Neverfull is meant to be a women’s handbag. So any Neverfull in Graphite is undoubtedly a fake. The Neverfull comes in three sizes – Large (GM 5.4 x 12.6 x 5.9), Medium (MM 12.6x 11.4 x 6.3) and Small (PM 11 x 8.7 x 5.1). Bags that don’t fit these sizes are not genuine Louis Vuitton. The symmetry of genuine Louis Vuitton women’s bags is their USP. Perfectly matched, square for square, circle for circle the pattern looks continuous, despite the side seam. The grosgrain lining all along the side should also be neat. 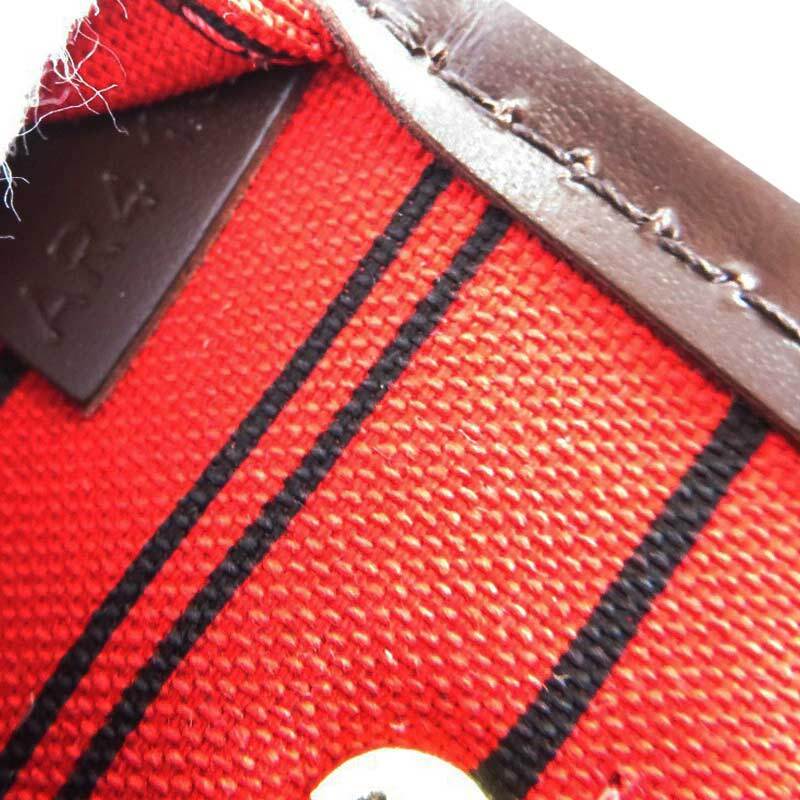 The position of the logo on the Damier canvas GM bag is in the 6th square from the top. There are a total of only 8 logos on the sides and the bottom has only one. In the MM and PM bags, the logo is on the 5th and 2nd square from the top, respectively. The logo is repeated every tenth square. Remember, the logo will never be split across or hidden partially by a handle or a seam. The colour of the leather trim and handles should be amber-honey coloured. Vachetta leather ages beautifully to acquire a golden-brown colour (termed patina) even if the bag has not been used. Should the colour be lighter, the handles have either been replaced and/or the bag is a fake. The ® above the LOUIS VUITTON. The ‘L’ in LOUIS VUITTON has a short tail. The O is perfectly round and looks larger than the other alphabets. The strokes of the TT almost touch each other. The ‘made in France’ has a lower case ‘m’. The heat stamp on the Ebene bag is always in red. The date code is stamped on leather attached into the right-hand corner of the inner pocket. The two letters of the alphanumeric code depict the country of manufacture. Of the four digits, the first and third stand for the week and second and fourth digits for the year of manufacture. Eg. 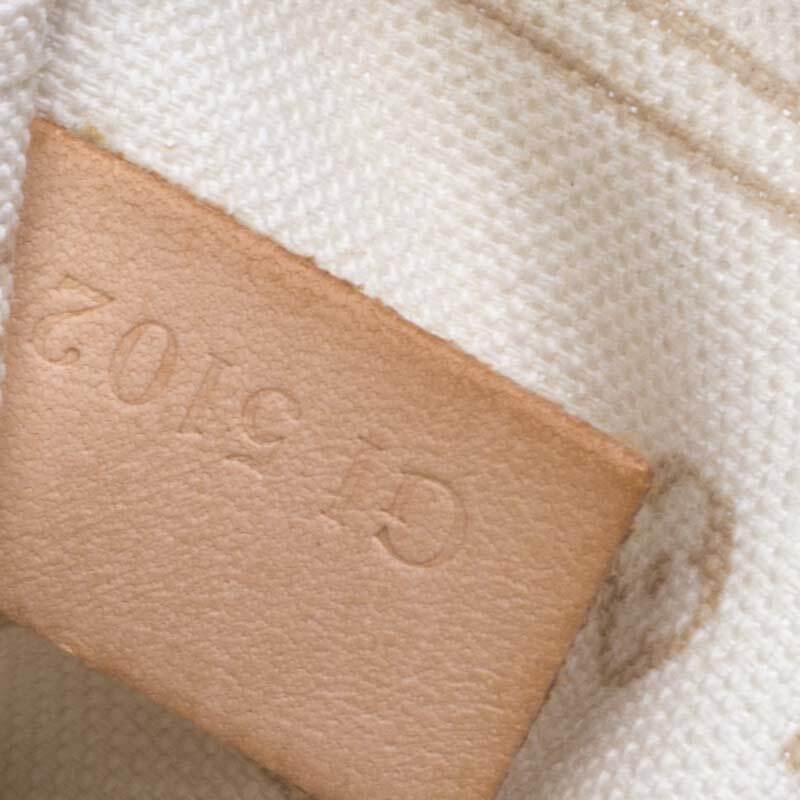 SD 2009 means Made in USA in the 20th week of 2009.The Neverfull Neo (NM version) released in 2014 comes with a pochette with a date code in the lining seam. Neverfull women’s bags made before 2014 do not come with the pochette bag. The fabric lining of the Neverfull has fixed colours. The Azur has tan while Ebene has red lining. Newer versions may also have yellow and fuchsia lining, depending on the year of production. Whatever the lining, the interior base should be a solid colour i.e. without stripes or monogram. The interior should have a seamed binding at the base. The interior pocket should go all the way to the bottom of the bag. If it doesn’t then, you guessed it, it’s fake! The straps of the Neverfull are thin and end in a bulb where they are attached to the bag. The “V” stitching on the bulb is actually an ‘LV” (L when viewed at an angle of 45° and V when viewed straight on). There are only 5 stitches on each side of the V. The red tone glazing on the edges is clean. Fake bags usually have waxy orange or bright red colour painted unevenly. D-rings (not just any circular rings) attach the handle to the bag. A relatively short ring holder attaches the D-ring to the bag. Stitching is evenly spaced and the number of stitches on one side will match those on the other side. There are usually 7-8 stitches per inch on a genuine bag. Louis Vuitton women’s shoulder bag handles always have a left – over – right stitching. LV brassware is always top quality whether it is the knob or the smooth finish of the lock. All hardware has an even-spaced Louis Vuitton engraved on the metal. Fakes may just have plastic studs with bright gold paint with irregular engraving. The Neverfull straps reduce the size of the bag when pulled in. The exterior straps should also have the D-ring on the end. 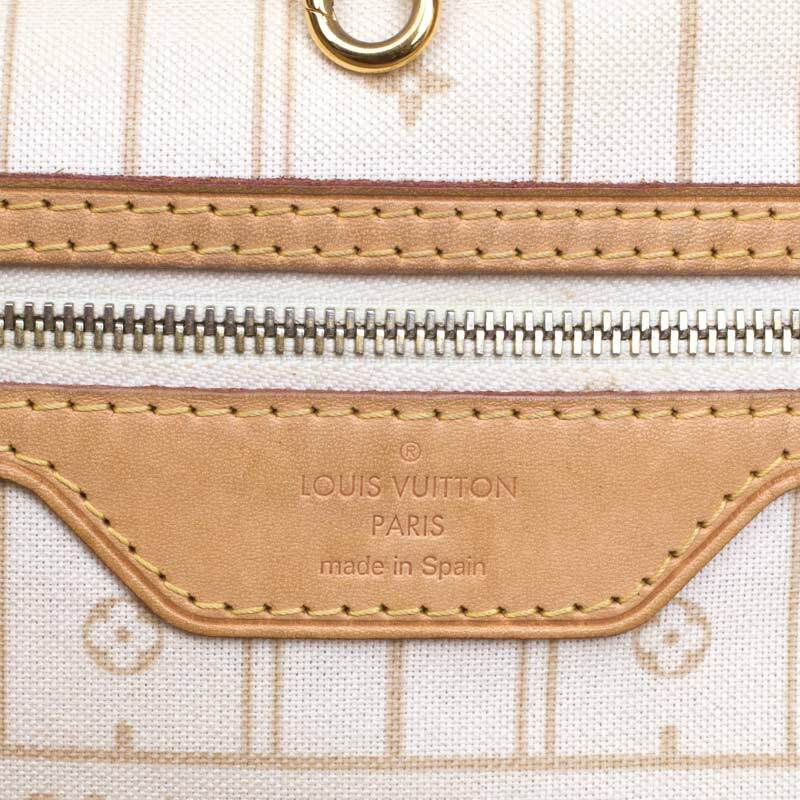 For women’s bags, Louis Vuitton zip-pulls have a groove along the edge with the engraved stud placed away from it. Anything that overlaps the groove is sure to be a fake. 2 cm is the space between the stitching on the zip pulls and rings or the heat stamp tab from the top of the bag. Anything less or more than 2 cm is a sign of a counterfeit bag! Armed with these pointers go ahead and take your pick of a genuine Louis Vuitton Neverfull…. it’s a purchase you will never regret! !